Blue Apron, which delivers ingredients to cook meals in your home and was among the companies whispered to go public this year, has now filed to go public. Amidst an array of enterprise companies that have jumped on the IPO bandwagon following Snap’s successful IPO (aside from its more recent whiff of an earnings report), Blue Apron appears to be the next major consumer IPO. That’s important, because it continues the tone that both enterprise and consumer companies see an opportunity to go public, which may signal additional activity as we go further into the year. There’s one unique twist to this consumer IPO, however: it was actually profitable in the first quarter last year. Blue Apron said it brought in $3 million in profit in the first quarter last year, though it swung to a wildly larger loss in the first quarter this year. While younger companies are expected to burn a ton of money (especially Snap, the largest consumer IPO in many years), Blue Apron appears to have been able to control its costs for at least a hot second before going into growth mode. The company is showing a rather incredible amount of growth. Blue Apron said it generated nearly $800 million in revenue in 2016, up from $341 million in 2015. For the first quarter this year, Blue Apron said it generated $245 million in revenue, up from $172 million in the first quarter last year. Despite all this, Blue Apron said it lost $55 million in 2016, though it said it lost $52 million in the first quarter this year. Getting into the unit economics, Blue Apron said it had 4.3 million orders in the first quarter this year, up from 3.7 million orders in the fourth quarter of 2016. That number of orders seems to be steadily increasing, with the company logging 2.9 million orders in the first quarter of 2016. Its average revenue per customer in the first quarter this year was $236, down from $265 in the first quarter last year. The company said the average order value in the first quarter this year was $57.23, which was a decline from the first quarter last year when it said the average order was $59.28. That might not come as a huge surprise as the company looks to continue to grow its customer base, which means it has to appeal to consumers that might be more price sensitive — even if it’s bringing them in at a trickle. It also has to improve its logistics and operations, which can drive the cost of those orders down. As Blue Apron’s competition heats up, its marketing costs are also going to balloon. This quarter, the company said it spent $61 million on marketing, up from $25.4 million in the first quarter last year. Last year it spent $144.1 million in marketing, up from $51.4 million in 2015. But that, too, shouldn’t come as a big surprise: As Blue Apron looks to expand beyond its metropolitan home bases like major cities, it’s going to have to make a much broader push for awareness among the more typical consumer. Not surprisingly, a lot of this spend is coming in the form of offline media. As a food-driven business, however, Blue Apron faces some interesting challenges that it’s laid out in its risk factors. Here’s one of the ones that stands out: food safety and food-borne illnesses. Blue Apron also says that variability in food costs — and generally changes in the macroeconomic environment and consumer spending — can also have a big impact on its business. That’s not too surprising as Blue Apron, which is often seen as a tech company, has to deal with a complex chain of logistics and moving parts that sources supplies from many different locations and businesses. 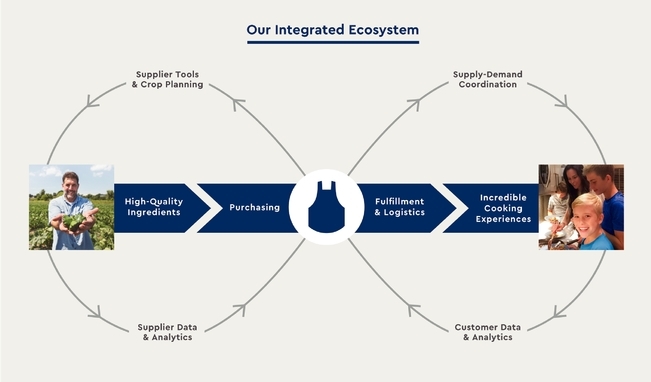 Blue Apron has to not only build out the sourcing network, but the technology to ensure that everything runs smoothly (and doesn’t break). Our business depends on a strong and trusted brand, and any failure to maintain, protect or enhance our brand, including as a result of events outside our control, could materially adversely affect our business. Unsurprisingly, Blue Apron looks to target a younger audience. Users between the ages of 25 and 44 years old make up more than half of the company’s business, which might not seem too surprising for observers of the meal kit market (and, in general, on-demand food industry). The company says it’s delivered 159 million meals nationwide. The IPO also looks like another big win for Bessemer Venture Partners, which owns nearly 24 percent of the company. First Round capital also owns around 10 percent of the company. Blue Apron has raised nearly $200 million in financing, with its most recent cash influx coming in 2015. That round was led by Fidelity, which owns 6.2 percent of Blue Apron. As time goes on, we’ll get a better sense of how much money Blue Apron will be raising — and also how valuable the company thinks it is as it gets closer to pricing its IPO. Now that it’s filed, we should expect Blue Apron to make its debut in the coming months, which will give us a sniff test on the whole meal kit market (and potentially on-demand meals as a whole).